And, in the blink of an eye, it was the final day of #badEMfest18. 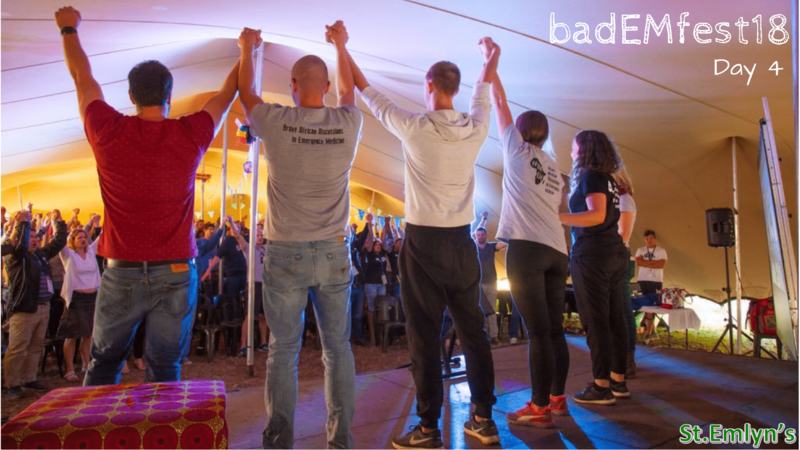 This is the final post on #badEMFest18 and it’s been a long time coming. Maybe that’s because it’s been busy, but it’s also that we’ve needed time to let the experience sink in and to realise why it was so special. Sunday started with a choice of three workshops, all of which were surprisingly well attended considering the Ubuntu post-karaoke had continued well into the night. I joined the faculty of the Simulation Workshop, coordinated by Ian Summers, where participants took a safari around five small group discussions with a Big Five theme; debriefing (facilitated by Sandra Viggers and Rowan Duys), simulation in the large group setting (facilitated by Andy Tagg and Ross Fisher), scenario design (facilitated by Ian Summers and Morten Lindkvist), procedural simulation (facilitated by Penny Wilson and Ross Hofmeyr) and simulated patients (facilitated by Jo Park-Ross with occasional input from me). The groups structured discussion around realistic learning needs scenarios and explored how simulation might form a part of the solution. I certainly learned plenty from our group – my favourite tip for simulated patient role play was the idea of having an expert faculty member (such as a psychologist) to specifically look at body language and non-verbal communication when debriefing communication scenarios. Elsewhere, Simon assisted Craig Wylie in coordinating a major incident management workshop. This covered a whole range of issues about the practicalites of managing major incidents. Obviously we talked about the MIMMS/HMIMMS systems of incident management as Simon is a co-author on HMIMMS (Ed – Second edition coming out this year btw). The contrast between managing major incidents in developed and metropolitan areas was contrasted with the experiences of major incidents in remote Africa. Kat talked about her work in managing the outcomes from a fuel explosion in Mozambique, which were really challenging in some many ways. The group discussed ethical, clinical, political, societal and practical difficulties that arise when incidents occur and we were able to draw many common themes that are irrespective of where and when an incident occurs. As a quick reminder the MIMMS/HMIMMS model of major incident management is the CSCATTT model. Think of this as the ABC of major incident management. We talked a lot about the complexities of triage and other aspects of major incident management. Notably my favourite quote of all when it comes to major incident planning. Kat not only shared her experiences of the remote management of the burns incident in Mozambique, but also the incredibly complex experience of having an incident in your own department. 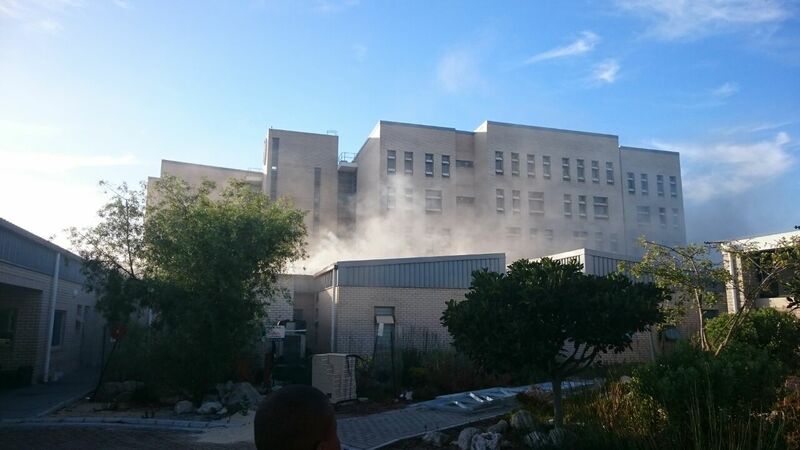 Last year Mitchell’s Plain hospital was on fire. Kat and her team incredibly managed the evacuation and response, an incredible story. After a short coffee break, the last session of talks began. Dave Thomson started the session with a talk on Organ Donation in South Africa. Frustratingly, it sounds as though the same social and economic barriers to organ donation exist in South Africa as in other places and there is room for progress to increase both uptake of and access to donated organs. The message was again that it is hard to deliver an organ transplantation service in a system where wealth dictates access to health care. We also saw similarities with the UK where the populations at most need of transplantation are perhaps the least able to access it. The was fascinating to reflect on within a health economy that gave us Christian Barnard and the world’s first heart transplant. A great talk. Carolyn Lewis followed with a talk about her experiences of cruise ship medicine. She focused particularly on the challenges of extracting patients who exceed the limits of care deliverable on board the ship – clearly a lot of thought goes into the logistics around these occurrences (I don’t think I have every heard the phrase “in case the helicopter crashes” used so many times in one talk!). It certainly sounds from Carolyn’s experiences that cruise ship medicine presents a specific challenge for practitioners keen to work in the primary/emergency care interface and to use their full skillset. The final talk of the conference came from MJ Slabbert, a South African anaesthetist (anaesthesiologist?) now living in Canada, who has worked in Africa, Europe and Australasia. Her perspectives of lessons learned from medicine across different continents contained many gems of wisdom with a through-running thread of patient safety – including the importance of self-care as healthcare professionals. Gosh, this is hard. Even now, several weeks after the event we are still trying to make sense of why this conference was so special. It had great organisers, an amazing setting and a unique approach in bringing glamping and a conference together. These are all objective matters that worked so well, but it was much, much more than that. On reflection it was the people and the interactions that came about as a result of the organisation and setting. This was a meeting of incredible people who were at first glance very diverse, but who shared a common purpose and vision for learning and care. It was, and still is a magical experience. The only other conference that comes close is SMACC, and amongst them the most closely aligned was the vibe at SMACCGold. I think we are also seeing those values commute beyond the conference itself. There are many examples out there but we particularly enjoyed this picture from the rather incredible @vytautasauks who took the UBUNTU message back to Lithuania. Will there be a second #badEMFest or was this a one off? We don’t know but we hear that there will be a second conference, and if that’s the case then you should put some time and cash aside to put this one on your must attend conferences for 2019. If you follow St Emlyn’s we’ll let you know when it is (as soon as we have secured our places). A run at the end of a day of learning is how I reflect on the small things that have impacted me most & how my frame has changed. An ophthalmologist and an emergency medicine doc and incredible hair! Amazing experience, exactly what I needed right now.